Just so that I can retire a page due to changes on the new theme, I still want to offer this guide to people who might visit Pune although it may be a bit old now . Despite most people in India following Hinduism, everyone still seems to get into the Christmas spirit. Our office tended to be rather noisy yesterday as plenty of secret santa-like jokes and presents unleashed themselves upon their victims, constant song dedications played, Santa (AKA yours truly) handed out gifts, and a series of skits performed by each team to everyone else in the office, all leading up to a fantastic Christmas party. The party coincided with the first anniversary for our office in Pune and so was a double celebration at a nearby hotel. With two huge reasons to party (who really even needs one?) it pretty much guaranteed most people on the dance floor for most of the night until the music ran out. There’s really something about large gatherings in India – the dance floor seems to be the centre of all attention and regardless of how well (or not so well in my case) you can groove it, everyone gives it a real good go. Last night, for instance, the first bus load literally spilled out of their seats and onto the dance floor where the DJ spun some (awfully mixed) tracks. See the rest of the pictures from the day here. 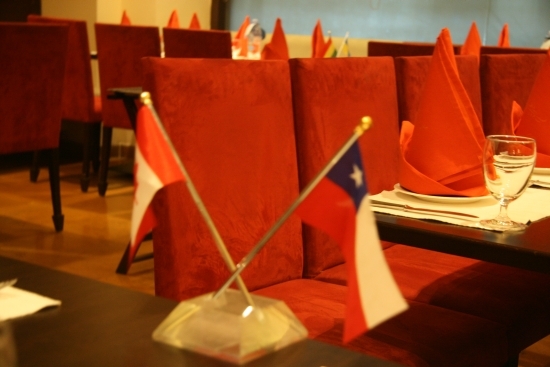 A restaurant that serves one or two dishes from almost every country around the world? There’s a very good reason it’s called Flags. Marketed at the higher end of the restaurant market, walking into Flags brings you into a very nice dining experience filled with plush red lounges opposite comfortably large chairs and twirled dining napkins at each settting. The bar at the back underscores the entire dining experience without being overbearing and just enough attendants float around without feeling like they’re all staring at you. As a foreigner, expect to be asked if you want Evian water – politely decline and go with the mineral water that is at least a quarter of the price. The next question in line will be the push for a bottle of wine – apparently they have a really great bottle and of course, it’s the most expensive on the menu. Settling for a couple of glasses of local wine isn’t such a bad experience. Now on to the food. When it comes to restaurants that serve this wide variety of food, either they’ll do some dishes very well and will only have a subset of the menu actually available, or they’ll do everything but most of them will end up pretty substandard. This restaurant falls into the latter category and that means you really have to order the right sort of food to actually enjoy your meal. I went for the Boston Clam Chowder followed by the New Orleans Grilled Fish and actually both meals for me was just about right. The clam chowder was a huge portion though the sourdough bread sitting in the midst of it was pretty awful (for sourdough bread at least) whilst the fish, perfectly grilled and well seasoned satiated my appetite perfectly. The other people in our dining experience probably had a much less successful night -the fajitas could have well fed two people but its tasteless mass barely satisfying the single person who couldn’t bear to eat it all. The burrito and a number of other dishes looked just as bad. Highlights: Huge offering of foods from all around the world with a very nice ambient atmosphere. Room for improvement: Obviously pushy with the higher end products and would be okay if their food matched the quality of the wines on offer. Often called a younger version of Bangalore, Pune has its own distinct culture most fuelled by the large number of Universities in the area. Last weekend, I managed to get around to see some of the more cultural spots around Pune and found it actually very impressive. Yup. And they’re pretty good. You can find them for only INR25 (30p) at the Marz-o-rin bakery in Pune. 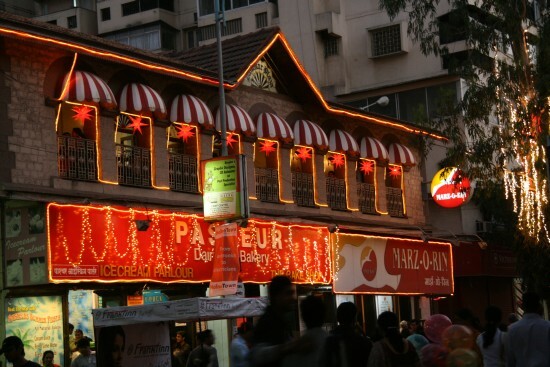 Located next to the large Wonderland complex on MG Road, it’s quite the institute with lots of different types of lassis, breads, and cakes. It’s constantly teeming with people going in and out and with lots of great things on offer, it’s no wonder they’re doing quite well. Go visit it if you’re here and try a Lamington. The lemon lassi was extremely good as well. Walking down back alleys sometimes bring you some surprises, and Toscana, located next to Soho’s is one of those pleasant ones. 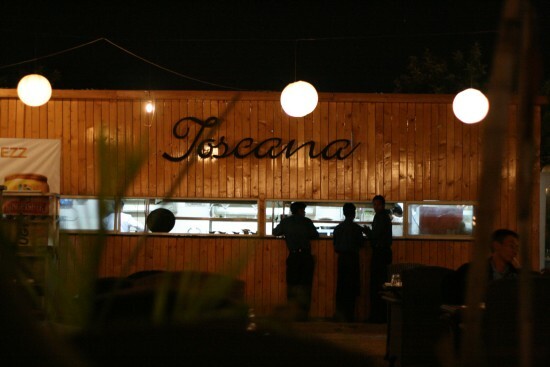 Toscana, if you can’t tell the name of it, offers a wide selection of Italian foods. Although like most Italian restaurants in India, they also bizarrely offer tex-mex cuisine despite the countries being continents apart. I really enjoyed the dining atmosphere. It’s all alfresco dining with a small number of tables under shades provided by stretch cloth. Given that it doesn’t rain that often, you’ve a pretty good chance that you’ll be okay. They string many hanging lanterns around the entire place, adding to the light mood with just enough ambient lighting. Tables are grouped in different areas, providing plenty of privacy – even for large groups. The rest of the open area is split up by plenty of greenery and taking away from the dusty surroundings that remind you that you’re in Pune. They only offer small bottles of beer, and I think they had a decent selection of wine though it tends to cost a lot in India. Our calamari starter with some aioli tasted very fresh – light and crispy without being overly cooked. The pizza – what a pizza it was – big enough to almost feed two people or one very ravenous person that barely stayed on the plate. Condiments at the table included balsamic vinegar, olive oil, chilli flakes (that are actually spicy!) and oregano leaves. The pizza had a nice and crisp base and this restaurant offered plenty of options including ham and bacon that is sometimes difficult to find. 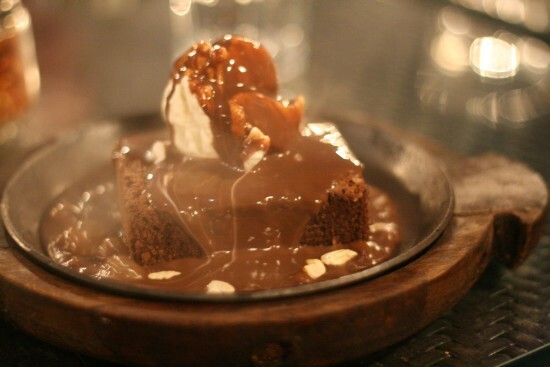 Several of us split a dessert, the strangely delicious sizzling brownie with ice cream. Imagine a hot sizzling plate with a large brownie, a scoop of vanilla ice-cream and then a hot chocolate sauce poured on it all when it reaches the table. It actually seems to work as well. I’d definitely come back here although I think I’d stick to the pizzas rather than the pasta’s since they didn’t look as appealing. Toscana offers a great atmosphere that easily catered for our party of 18. Found at: Tucked behind Bishop’s School in Kalyani Nagar (on its right) and situated right next to Soho’s. 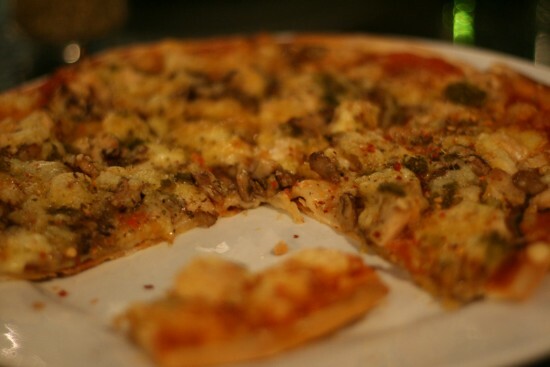 Highlights: Huge pizzas, great alfresco dining room. Cost: I I think this averaged about INR700 each with starter, main, dessert and beer. In understand if people in another country have difficulty understanding my accent. Strategies I’ve tried is to speak slower, to speaker clearer, or try to use similar sounding words. I tried booking a table at a popular place near work and repeated my name and number at least fifteen times. The people there handed me to about three different people and they at least finally took my number down. 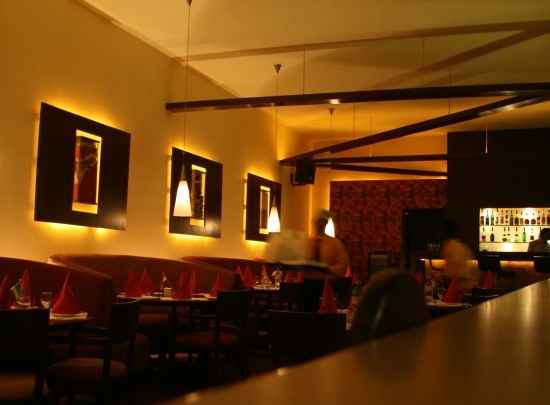 Located off the main road in Koregaon Road in Pune, this pan-asian restaurant serves a vast menu of pan-asian foods. With a small area for al fresco dining, Malaka Spice appears popular with locals and foreigners alike. Each table is lit with a clever floating candle in water device with enough light to add ambiance without hindering anyone’s ability to see. They serve a variety of alcohol and although I don’t remember any specific music here, had a low-key enough atmosphere to have a great conversation and still feel like you’re still around a lot of people. One of its unique properties is the art work they advertise all around the place. The tables have mugs you can buy, the walls also hanging art for sale and I think they offer cartoon characterures on specific days as well. It’s not grossly in your face as many other places can be and before we even knew it, most of the table centric ones had disappeared (probably more so to stop them disappearing into any bags than anything else). Service here is brisk and it’s pretty easy to flag down a waiter if there’s any need. The quality of the food is pretty decent although they managed to stuff up some of our orders with a couple of starters coming with the main dishes. On the other hand, they didn’t hesitate to keep asking us if we wanted to get a top of our of pitcher of beer. We all had a pretty enjoyable night and I’d definitely come back here again. We had some great seafood dishes and there’s plenty more to try. Highlights: Wide selection of pan asian dishes in a popular al fresco dining atmosphere with generally friendly service. Room for improvement: Getting the food out on time would have been nice, without the need of being excessively pushy with drinks. Cost: I can’t remember exactly how much we paid, but I think it was in the order of INR600-800 for starters, mains with rice/noodles, and beer.